Over a year ago, due to budget constraints, Alabama State Parks was forced to shut down Roland Cooper SP, near Camden, Alabama. The park was beloved by the local community and an important economic asset to the town of Camden. As a result, a lot of local folks put pressure on the state to find some other solution than just closure. To its credit, the Alabama State Parks Department was willing to consider private options that most state agencies refuse to countenance. The end result is that my company will be reopening the park -- still a public asset but operated privately -- in time for Labor Day. The full announcement is here. We are still working on the permanent web page, but if you are in the area our Facebook page is here. Today I gave notice that I was exiting another park operations contract in California. This location has always been marginal, but we kept holding out hope of improving it. But with rising CA minimum wage, the PPACA, and onerous CA labor and liability laws, operating in CA is so hard that I have to make good money or get out. I had to pick a termination date at the end of the summer. I was going to choose Labor Day but looking at the calendar, it gave me a smile to slip the date to September 2, a date that should be familiar to anyone who is a real Atlas Shrugged geek. It is an inside joke guaranteed not to be recognized by any of the government agency managers we work with there. Gee, I Wonder Why Teen Unemployment Is So High? I just opened a summer-seasonal camping business in Washington state. Given that I mainly need relatively unskilled help landscaping and cleaning up from Memorial Day to Labor Day, one would think that this would be a natural place for high school kids to look for work. Well, check out my new Washington business license. This is not something unusual for me, it's the standard form issued to all businesses. Check out the last line. You can do anything you want, but for God sakes don't employ any high school kids over the summer. Sorry teens. I don't know what kind of special application is required to get the state's permission to employ you, and I don't have time to find out -- particularly since whatever additional license to hire teenagers that I need to obtain is likely to entail all kinds of onerous special rules and reporting requirements. Update: I get asked this a lot when I post such business licenses. 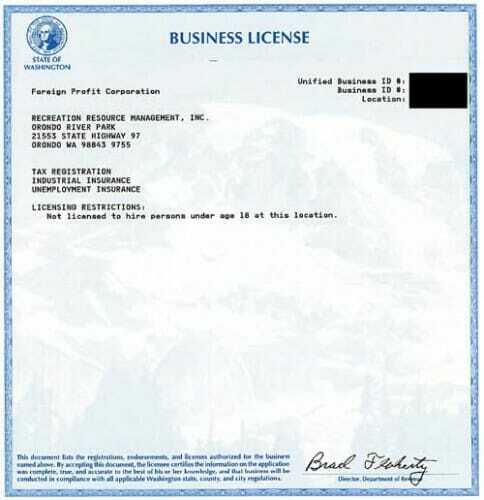 "Foreign Profit Corporation" does not mean that I am based in Sri Lanka, "foreign" in this context means that my original corporate registration is in another state. I will give kudos to WA state on one dimension -- most states will issue me separate numbers for my withholding account, my sales tax account, my workers comp account, my unemployment account, my secretary of state registration, etc. WA issues a single number for everything. Back in August, when I wrote the first section of this guide, I was sitting in Long Island at a baseball recruiting camp. Now that my son has completed the process, I want to share the rest of our experience for others who, like myself, have an athletic kid but no idea how the college sports recruiting process works. Some reminders. First, this is baseball-specific -- other sports work differently, I presume. Second, this is the experience of a kid with good baseball skills but not good enough to have been scouted by a Division I baseball power like Texas or Arizona State. Third, my son was not looking for scholarship money. He was looking to play baseball in college, and to parlay his baseball talent into admission in a top academic school. We were looking at division III (DIII from now on) schools like Williams, Amherst, Haverford, Pomona and a few DI Ivies. Finally, our experience is heavily colored by the fact that he plays for one of the smallest high schools in the state, so getting attention and recruiting advice was much harder than if he had played for a baseball powerhouse. The DIII baseball recruiting process does not really even begin until the summer between Junior and Senior year. My son landed a good spot without a single coach even knowing he existed as of June 1 before his Senior year of high school. As late as January of his senior year he was still getting emails from coaches asking him if he might be interested in their school. He went to several camps, which fell into two categories: School camps, at schools he was really interested in; and multi-school camps run by third parties. Of the latter, I am convinced the Headfirst Honor Roll camps are the best if you are interested in DIII or DI "smart schools" (e.g. Ivies, Duke, UVA, Stanford). OK, so we left off with my son at a two-day baseball camp. My son sent out emails afterwards to the coaches that were at the camp and from schools in which he was interested. Basically he said "nice to have met you, still really interested in your school; now that you have seen me, I'd like to know what you think." He had a few good conversations with coaches at the camp, but after that we really did not hear much until after Labor Day. In retrospect, this delay is probably because the coaches have lots of camps and they want to synthesize their prospect list after all the camps before talking in earnest with players. We really did not know what to expect. Would coaches call, and if they did, what were the next steps? It was only later that we learned what outcome we should be hoping to hear: Basically, each coach is given some spots by the admissions office (the average seems to be 5 for the baseball guys). If your kid can make that list, then two good things happen: a) it means the coach wants the kid on the team. And b) it generally means the kid will get a good shove to help him through the admissions process, not an inconsequential thing at a school like Princeton or Amherst. The coach asks my son to send his transcript and SAT scores early to the Admissions office. The Admissions office vets these, and gives the coach a reading -- for us, that reading was generally "if you put this kid on your short list, coach, he very likely will get in." The coach then passed this message to my kid, saying there are no guarantees (etc. etc.) but all the kids with this same read from the admissions office who have been on his list have gotten in in the past. BUT, there is a bit of a catch. The coach will say that he can only put my kid on his list if we will commit to applying early decision. Early decision (ED) means that one applies in November and hears in December (so well earlier than the April 1 regular admit date), but it is a binding commitment to attend if admitted. This means that one can only apply to one school early decision. Coaches aren't dumb. They can't afford to waste the few recruiting spots they have on kids who aren't going to come. So there is a quid pro quo - the coach will commit to the kid and help him through admissions, but the kid has to commit to the program. But we only learned this later. When coaches started calling, we weren't sure what to expect. A couple called early to say that my son would not be on their list. I have to give kudos to Coach Bradley from Princeton -- he called and told my son he wouldn't make the list. It was not the news we wanted to hear, but he was up front and honest with us so we did not waste our time. He was also the one who really explained all the stuff I wrote above, so we were more knowledgeable when other coaches called. Soon, however, we were getting floods of interested contacts. Many were from the coaches he had proactively contacted. Some were from schools we never had heard of, and some were from very good schools but in parts of the country that weren't in his college search area (e.g. Kenyon, Grinnell, Carlton in the midwest). Many of these coaches asked for him to come to campus (on our own dime, they were not paying) for a visit, including an overnight stay with someone on the team. Eventually my son scheduled visits at Wesleyan, Bowdoin, Vassar, and Haverford. He chose these in some cases for the school and in some cases because he really liked the coach. All four of these offered him a spot on the short list for admissions if he was willing to go ED. It was at this point that we hit the highlight of the whole process. Like many parents, I just want to see my kid gain life skills. My son will never be a good sales person. He is really, really hesitant to cold call adults to ask them for something. This process was good for him in that sense, because he began to see the fruits of having proactively cold-called these coaches earlier in the process. But I still had to poke and prod him to do it. However, with these other visits set up, my son was apparently thinking "these would all be good schools, but they are not in the top tier of my aspirations." He was thinking about skipping ED, and trusting his grades and resume to the regular admissions process so he could still take a shot at his top choices (places like Princeton and Stanford). This is where the breakthrough came. Without my prodding or even involvement, my son contacted Coach Hamm one more time, to say he had not heard from Amherst but he was still really interested and he would be touring other nearby colleges in a week or so and would still love to meet with him. We will never know exactly what happened. Perhaps the coach was late in kicking off his recruiting. Perhaps another kid on his list dropped out. Perhaps he just wanted to sit back and see which kids were the hungriest. Whatever the case, Coach Hamm wrote back immediately and said he would love to meet my son on campus (he actually changed around a trip to be there). The process described above played out (grades to the Admissions office, offer to be on the "list", ED application) and long story short, Nic will be at Amherst next year. As I mentioned earlier, there was no money offered for baseball (nor could there be in leagues like the Ivies or the NESCAC which ban athletic scholarships). Amherst has a great financial aid program, and there are great possibilities for scholarships, grants, and tuition discounts -- but these are offered to all admits, not just to athletes. I hope this is helpful to some folks who are just starting this process -- I know it would have been a huge help to us to understand in advance. Postscript: One of the hardest things in the world is to get a good honest reading on your son's talent, particularly if he does not play for a top high school team. People have told my son that he should not have gone DIII, he could be playing DI or he should be in front of pro scouts. You have to take all this stuff with a grain of salt. Sure, you don't want to cut off an opportunity, but on the flip side, sort of like the fox and the cheese, you don't want to lose a good thing chasing the illusion of something better (we know folks this happened to in other sports). I don't know how to solve this, maybe people have experiences they can put in the comments. For us, being from a small school, several summers playing club ball in a wood bat leagues with the big school kids finally convinced us our son could play at a high level (I say convinced us as parents, our son does not lack confidence so he always knew). Well, it's my first airline flight of the summer, and, as usual, I have forgotten how awful it is to fly between Memorial Day and Labor Day. And it is not just the crowds. I hate to sound overly misanthropic, but summer is when all the folks who have never been on an airplane show up at the security station right in front of me. It is amazing how long a family of four who has no clue how airport security works can hold up an X-ray line. Of course, this being the vacation season government employees, capacity actually was lower today (fewer X-ray lines open) to meet the higher demand. Update: Perfect weather in Phoenix and at my destination in Denver. So of course we have a 2-hour air traffic hold. the president pretty soon, I'm a goner."